not online much until exams finish! Please talk to globaltacticalofficer if you have queries! 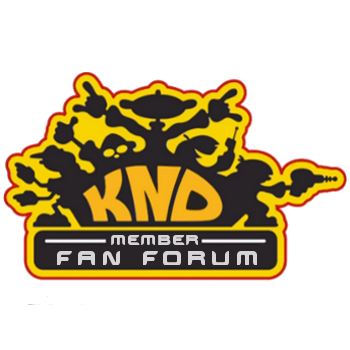 Q: In what section can I put reviews of various KND fanfictions (in the style of The Nostalgia Critic)? A: Make a new thread (or as many as you like) on the fan fiction board please! Q: How does the ranking system under our user names work? Like you go from cadet to > ? >? The more posts, the higher you rank until you're a moon base operative. Q: Are we going to have contests such as art contests and contests of who is the most artistic,funniest,etc? There is now a contests board to go to! Favourite Episode: Operation: C.A.M.P., Operation: B.E.A.C.H, Operation: J.E.W.E.L.S, Operation: F.L.U.S.H., Operation: I.T., Operation: P.A.R.T.Y. In what section can I put reviews of various KND fanfictions (in the style of The Nostalgia Critic)? Quality Fanfiction (for me) = No OCs or a few good OCs, no AU, mostly canon characters or canon only! Quote of the Month: Have you tried turning it off and on again? I'd really like to see that. Make a new thread (or as many as you like) on the fan fiction board please! I can also make a sub-board for fan fiction reviews if you'd prefer. How does the ranking system under our user names work? Like you go from cadet to > ? >? Are we going to have contests such as art contests and contests of who is the most artistic,funniest,etc? Codename: Kids Next Door & all text and images related © Cartoon Network & mr Tom Warburton. All rights reserved.